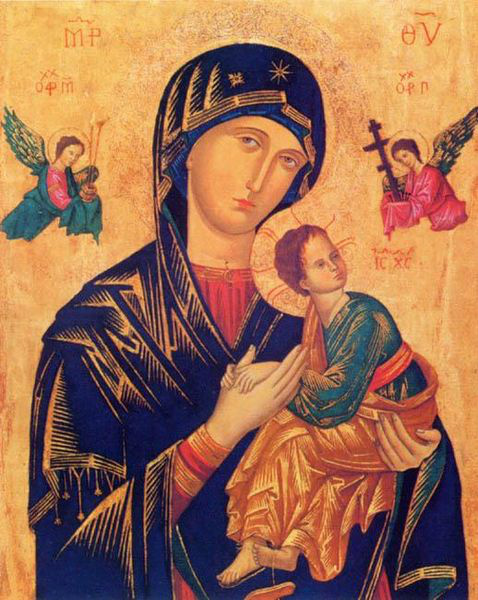 DEVOTION TO THE MOTHER OF PERPETUAL SUCCOUR. O Mother of Perpetual Succour, lend me thy all-powerful aid, and may I ask this favour of thee without ceasing. Amen. O Mother of Perpetual Succour, pray for us thy children. Obtain for us that we may continually have recourse to thee. O HOLY Virgin Mary, who, in order to inspire us with an unbounded confidence, hast been pleased to take the sweet name of Mother of Perpetual Succour, I implore thee to come to my succour always and in all places, in my temptations and after my falls, in my afflictions and trials, and in all the sorrows of this miserable life, but especially at the hour of my death. Obtain for me, O loving Mother, the grace of ever having recourse to thee, for if I am only faithful in calling upon thee, thou wilt always be faithful in coming to my assistance. Obtain then for me this grace of graces, the grace of ever having recourse to thee with a child like confidence, that, by means of my faithful prayers, I may ever merit thy perpetual succour, and final perseverance. Bless me, O most loving and compassionate Mother, pray for me, and succour me now and at the hour of my death. Amen. BEHOLD at thy feet, O Mother of Perpetual Succour, a miserable sinner, who has recourse to thee, and puts his trust in thee. O Mother of Mercy, have pity upon me! I hear thee called by all the refuge and the hope of sinners; be then my refuge and my hope. Succour me, for the love of Jesus Christ; stretch forth thy hand to a fallen wretch who recommends himself to thee, and who dedicates himself to thee as thy perpetual servant. I bless and thank God for having in His mercy given to me this confidence in thee, the pledge, as I believe, of my eternal salvation. Alas! too often in past times have I miserably fallen because I had not recourse to thee. I know that with thy help I shall conquer; I know that thou wilt help me if I recommend myself to thee; but I fear lest in the occasions of falling I should cease to call upon thee, and so should lose my soul. This, then, is the grace I seek from thee; and I conjure thee, as far as I know how and can, to obtain it for me, namely, in the assaults of hell always to have recourse to thee, and to say to thee, O Mary, help me; Mother of Perpetual Succour, suffer me not to lose my God. Almighty and merciful God, who, to succour the human race, didst will the Blessed Virgin Mary to be the Mother of thine only-begotten Son, grant, we beseech thee, that through her intercession we may shun the infection of the devil, and serve thee with a true mind. Through the same Christ our Lord. Amen. O MOTHER of Perpetual Succour, grant that I may always invoke thy most powerful name, for thy name is help in life, salvation in death. Ah, Mary most pure, Mary most sweet, let thy name henceforth be the breath of my life. Tarry not, O Lady, to come to my succour whenever I call upon thee: for in all the temptations which shall assail me, in all the wants which shall befall me, I will never cease to call upon thee, and to repeat again and again, Mary, Mary. What comfort, what sweetness, what confidence, what tenderness, does my soul feel in the mere mention of thy name, in the very thought of thee. I thank the Lord for having given thee for my good this name, so sweet, so amiable, so powerful. But merely to pronounce thy name is not enough for me. I wish to do so out of love; I wish that love may remind me to call thee always Mother of Perpetual Succour. Five Hail Marys and the prayer as before (as on the First Day). O MOTHER of Perpetual Succour, thou art the dispenser of all the graces which God bestows upon us wretched creatures; and for this end has he made thee so powerful, so rich, so kind, in order that thou mayest succour us in our miseries. Thou art the advocate of the most miserable and abandoned criminals who have recourse to thee; help me, then, who recommend myself to thee. I place my eternal salvation in thy hands, to thee I consign my soul. Number me amongst thy more special servants, take me under thy protection, and I am satisfied; yes, for if thou helpest me, I fear nothing; neither my sins, since thou wilt obtain for me the pardon of them; nor the devils, for thou art more powerful than all hell; nor even Jesus, my very Judge, because by one prayer of thine he will be appeased. My only fear is that through my own negligence I should cease to recommend myself to thee, and should thus be lost. Obtain for me, my Lady, the pardon of my sins, the love of Jesus, final perseverance, and the grace of ever having recourse to thee, O Mother of Perpetual Succour. Taken from: The Parorchial Garden of the Soul, containing Devotions for Mass and Benediction, IMPRIMATUR. January 29, 1877. Mother of Perpetual Succour, suffer me not to lose my God.